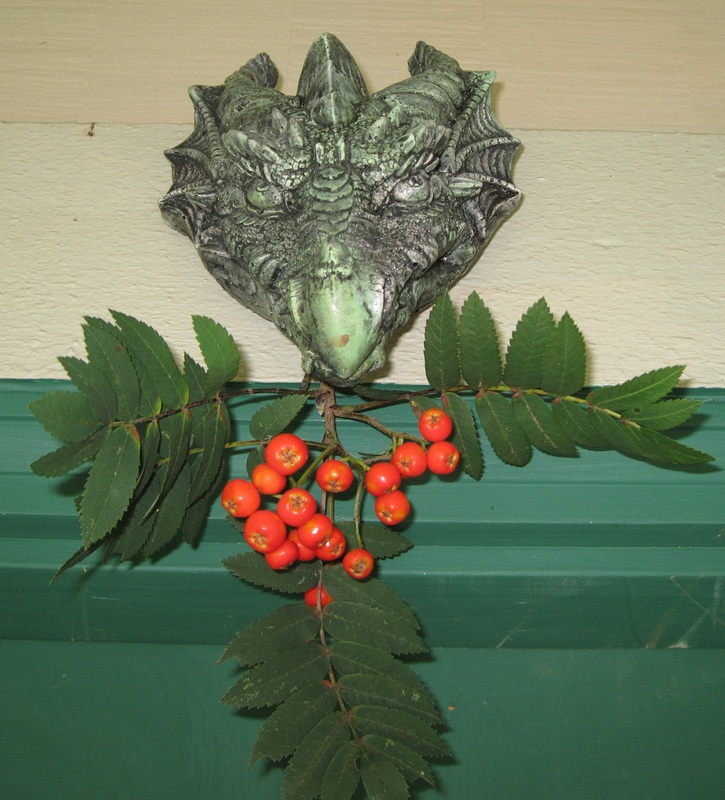 The Dragon guarding our front door, with Rowan berries. It’s Lùnastal, also known as Lughnasadh and several other names including the first of August. Lùnastal is among other things a harvest festival; a time to celebrate the first fruits of summer and to anticipate the bounty of the harvest season. This seems a good time to reflect on the things I have accomplished, or not accomplished, so far this summer. Confession time. Summer is more than half over, and since my kids said goodbye to elementary school in June, I have not finished a single story. I foolishly (or responsibly – my POV changes) scheduled summer activities that meet my children’s needs instead of my own. After all, being a parent is my day job and writing is my hobby. Our summer started with the biennial Slighe nan Gaidheal 2012 Seattle Fèis. I reprised my 2010 committee role as registration manager on top of my newish role as Slighe Treasurer. It was a truly wonderful experience and because of the hard work and dedication of many people, especially event chairs Seumas Gagne and Kate Freeburg, a tremendous success. But until recently I was utterly burnt out. What have I been doing to improve my writing, when I can’t get more than ten or fifteen minutes in a row of quiet writing time? I have been reading. Pretty much any writing instructor or author will tell you that reading in the genre you’re writing is essential, and I have definitely found that to be true. Before I started trying to write short stories, I hadn’t actually read many short stories. (Charles de Lint’s short stories are the exception; I’ve been reading both his novel-length and short fiction for a long time.) So I’ve been reading short stories from online speculative fiction eMags. I just finished a collection of Connie Willis’ short fiction, and yesterday I bought a Steampunk anthology edited by Sean Wallace. I could also claim to have writer’s block, except that would be a lie. What I have is more like writer’s ADHD. I start reworking a story that’s been languishing in the first-draft stage, and then I get distracted by a new idea. I take a break to write down the idea (either for a new story or some aspect of an in-progress story) and tell myself I just need to make sure I don’t forget it. The next thing I know, I’m writing that new/other story. Until the next distraction! This entry was posted in Writing Path and tagged distraction, Lùnastal, Lughnasadh, procrastinate, writing. Bookmark the permalink.